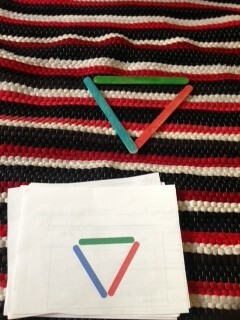 Montessori Monday: Craft Stick Puzzles! Welcome back to Montessori Monday! I’ve been neglecting the blog lately because I’ve been so bogged down with work. I wanted to take a break today and share this great activity with you though! This is a work we’ve had out for a few months now but my son was never really interested in it. This morning he dove right in and did the whole thing so I thought I’d share it. He is almost exactly 4.5 and has great attention to detail. We introduced this about a year ago and he wasn’t interested so I put it back out this past winter. 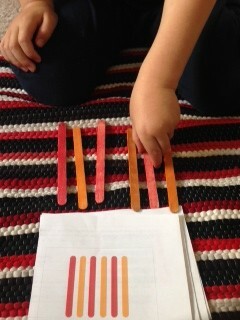 Pattern matching in one form or another is always found in a Montessori classroom. 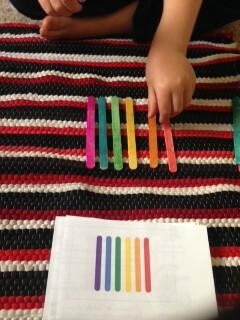 Sometimes it will be colored blocks, others colored beads and sometimes these colored craft sticks. I printed up a great FREE printable from Learny McLearnerton (cutest name!) with a bunch of patterns that can be replicated with craft sticks. We had a bunch of plain ones someone had given us so we painted them with Do-A-Dots. You’ll want 3 of each color. There are 12 different puzzles but you could create more. All I did to introduce this activity was to give him a pattern and ask if he wanted to try making it out of the craft sticks. I sat quietly and watched while he made each pattern. As you can see in the picture above sometimes they end up spaced unevenly or with the colors out of order. Shapes are also included in the set! When your child completes a card ask if they’d like to do another one. Respectfully let them do as many as they would like and then move on. We’ve been enjoying doing some free building with the sticks afterwards too. I think my next step is going to be having him trace the sticks and creating his own pattern and shape sheets. I hope you’ll enjoy these as much as we have been. 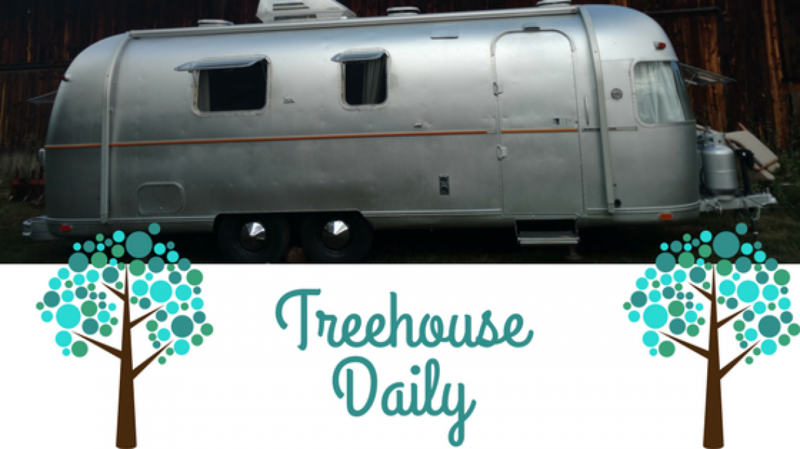 This was a great find and Learny McLearnerton has a lot of other great freebies too!